Perfect-Fit™ CNP Model Custom Noise Protection ear plugs are made of JB1000 medical grade silicone for maximum durability and comfort. 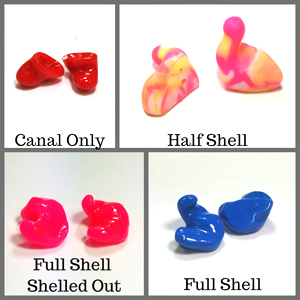 To let you express your personal sense of style, Perfect-Fit™ CNP ear plugs are available in a wide range of colors, and with several optional enhancements including multi-color swirl, glitter and even glow in the dark. Perfect-Fit™ CNP is available in full shell, half shell or canal only to accommodate most variations in the need for other protective headgear, dual hearing protection systems and personal preference. 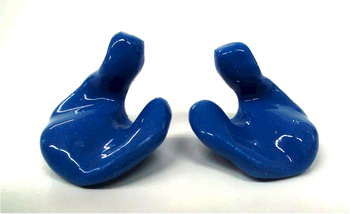 Perfect-Fit CNP Model Custom Noise Protection Ear Plugs (One Pair)5JayMay 7, 2016Great customer service and product! Perfect-Fit CNP Model Custom Noise Protection Ear Plugs (One Pair)5Z-DawgJuly 7, 2015Excellent customer services and an excellent product. I can wear the earplugs all day. Perfect-Fit CNP Model Custom Noise Protection Ear Plugs (One Pair)5RanaW.March 9, 2015I've been using these earplugs for about two years now. They are good as new and absolutely a writer's best friend. I don't know what the folks next door are doing right now, but as soon as I put my earplugs in place, it all goes away. I will never be without a set of these again. Ever! Worth every dime. Perfect-Fit CNP Model Custom Noise Protection Ear Plugs (One Pair)5WhiskyTangoFoxtropSeptember 11, 2014Worth the investment. Perfect-Fit CNP Model Custom Noise Protection Ear Plugs (One Pair)5J. HernandezNovember 28, 2013I second everything Nameer (first reviewer) said. This is simply the best investment if you are serious about studying in complete silence. Perfect-Fit CNP Model Custom Noise Protection Ear Plugs (One Pair)5Nameer AzalddinApril 22, 2013I am a medical student and currently preparing for my medical licensing examinations. I use these earplugs for studying at home or at Starbucks. These earplugs are very comfortable and block about 80% of the sound around me. I can do practice exams and read study materials for hours without any discomfort. I have tried other generic earplugs and they don't come close to these custom plugs. I would recommend these earplugs for anyone who wants to do some studying or work in a public place, or at the comfort of their own home. The reason why they are good at home is that I am not bothered from hearing my roommate talking at the phone, or him watching TV downstairs. These earplugs have solved a lot of problems for me. Perfect-Fit CNP Model Custom Noise Protection Ear Plugs (One Pair)5S.C. Dallas, TXJanuary 28, 2013I purchased my ear plugs about 5 years ago. I work in a cubical and it can get noisy in the office. So, I initially bought them to try to help me concentrate by drowning out noise. But I also use them to sleep if someone is snoring or if there are other noises keeping me awake. This was the BEST $117.50 I ever spent! Perfect-Fit CNP Model Custom Noise Protection Ear Plugs (One Pair)5C.S. Brunswisk Ga.January 28, 2012Ordered them, did not know what I would get. Was very surprised. The best thing I have purchased.Custom fit was great,and they work fantastic.